I hope everyone had or is having a wonderful Valentines day. 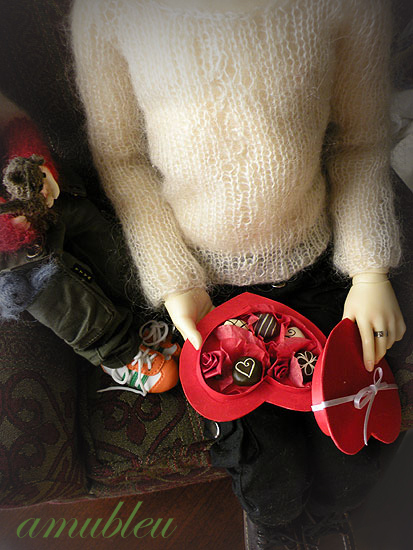 Tsuyoshi was hoping that Hitomu would allow him to exchange teddy for a chocolate. Luckily for teddy, Hito decided he could do with out but that he would be more than happy to share his chocolates with Yoshi-kun. I don’t remember ever showing these off but the tiny chocolates were from Cali, through the Valentines swap she organized last year. So adorable and just the perfect size (Yoshi needs two hands to eat one though XD). The swap was a lot of fun and these little guys just reminded me that I need to do more of them. They are loads more fun when it’s with people you know.